Welcome to the Great Sand Dunes National Park Information Page. 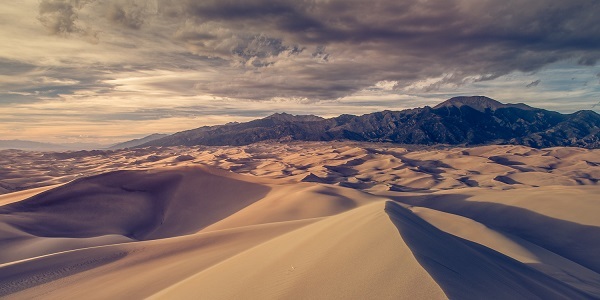 Great Sand Dunes National Park and Preserve is one of the most biologically and geologically diverse parks in the United States. Great Sand Dunes National Park is located 35 miles northeast of Alamosa, Colorado, reached by U.S. 160 and Colorado 150 from the south, or from Colorado 17 and County Lane 6 from the west. By car: From Denver, Colorado Springs, or Pueblo, the fastest route is south on I-25 to Walsenburg, west on US 160, north on state highway 150. For a more scenic drive from Denver or Colorado Springs, you may also get on US 285 south, then state highway 17 south, then County Lane 6 east. From Albuquerque, drive north on I-25 to Santa Fe, then north on US 285 to Alamosa. By air: Commercial air service is available to a small airport at Alamosa, Colorado. Colorado Springs and Denver are served by many commercial airlines. Rental cars from major rental companies are available at airports in Colorado Springs and Denver. Rental cars may be available in Alamosa: call L&M Auto Rentals at 719-589-4651. By bus: There is no public transportation to the park itself, but Greyhound Bus Lines serves Alamosa and Blanca, Colorado. Call 800-231-2222 for fare and schedule information. During the Paleozoic Era, over 500 million years ago, shallow seas and river systems deposited sedimentary materials throughout the region. Eons later, pressures from within the Earth pushed the landscape high above sea level, limiting sedimentary deposition and leaving a gap in the region’s Mesozoic record. Around 40 million years ago, an arid landscape dominated where rivers and intermittent lakes emerged and subsided upon the land. Recurring lava flows poured onto the landscape about 34 million years ago from volcanic vents in the San Juan mountains, creating a subsurface layer that geologists call the Conejos Formation. Rapid uplift of the Sangre de Cristo Mountains began about 19 million years ago. Rifting associated with the uplift widened the valley and caused its floor to drop significantly. (This process continues today.) Around five million years ago, a new series of volcanic activity rocked the region, at times damming rivers that flowed out of the southern half of the San Luis basin. The Pleistocene began 1.8 million years ago as climate changed globally. Glaciers grew in mountain valleys, some pouring ice and rock far into the San Luis Valley. Many scientists consider the Pleistocene to be the period in which dune formation began in the San Luis Valley. Only about 12,000 years ago, a warming climate melted many glaciers worldwide and signaled the end of the Pleistocene. Large quantities of silt, gravel and sand were carried by rivers and streams into the San Luis Valley. Today, the rivers and creeks continue to transport sediment into playa lake systems which are sources of sediment for dune-forming winds of the San Luis Valley. Great Sand Dunes National Park and Preserve is open 24 hours a day, all year. In winter, the Visitor Center hours are 9:00 a.m. to 4:30 p.m. daily, except for federal holidays, when the building is closed. In spring and fall, the Visitor Center is generally open 9-5; longer hours may exist as staffing permits. Summer hours at the Visitor Center are generally 9-6. Call ahead at (719)378-6399 for specific hours on the days you plan to visit. Entrance fees are $3 per adult (age 16 and older). Entrance fees are valid for one week from date of purchase. Children are free at all times. Pets may go anywhere outdoors in the park and preserve, as long as they are kept on leashes at all times to protect wildlife and respect other visitors. Cleaning up after pets is required. Pet safety: Summer sand can blister paws; extreme dune heat (it’s much hotter closer to the surface of the sand) can cause heat exhaustion or stroke. Pets left in vehicles without adequate ventilation can succumb to suffocation. Rolling the windows down a little does not provide adequate ventilation. When the outside temperature is 85*F the temperature in the vehicle can climb to 120*F in 30 minutes! Visitors to the park can enjoy a variety of attractions, both while hiking or checking out the visitor center. Consider a walk on the dunes around sunset; what better way to watch the closing of the day than from a dune ridge line? Spring at Great Sand Dunes can mean anything from warm sun and mild spring temperatures to chilly winds or blizzards – sometimes in one day! At this 8200′ (2470 m) elevation, be prepared. Have clothing available for a warm, calm day splashing in the water, but also for snowy or windy conditions if needed. Summer temperatures at this 8200′ (2470 m) elevation average in the 80s F., with lows at night averaging in the 40s F. July and August can bring heavy afternoon rainstorms with lightning. Fall at Great Sand Dunes can mean anything from warm sun and mild fall temperatures to blizzards – sometimes in one day! At this 8200′ (2470 m) elevation, be prepared for any conditions. Typically, however, fall days are sunny with highs in the 60s to 70s F. and lows in the 30s F. Fall colors generally peak in late September to early October. Winter at Great Sand Dunes offers solitude, natural quiet, and incredibly clear day and night skies. Days are generally sunny and chilly, and the sand may even feel warm in the intense alpine sun. But be prepared for any winter conditions at this 8200′ elevation, including blizzards and subzero temperatures at night.